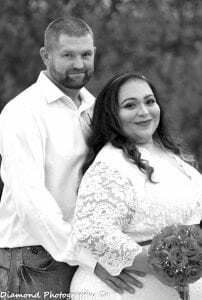 Evelyn Morales of Edinburg and Dennis W. La- Grange of Pleasanton were united in marriage on Jan. 18, 2019. The bride is the daughter of Lydia Vallejo of Edinburg and Gilberto Morales of La Blanca. She is the granddaughter of Herminio Vallejo of Edinburg, Mercedes Vallejo of Edinburg and Lorenza D. Morales of La Blanca. The groom is the son of Dennis A. LaGrange of Pleasanton and Waynette Smelley of Pleasanton. His grandparents are Riley LaGrange of Pleasanton, Helen Lucile Reese Voss of Pleasanton, Wayne Smelley of Pleasanton and Bobbie Smelley of Pleasanton. The 4 o’clock ceremony was officiated by Orlando Carrasco, Justice of the Peace, at Justice of Peace Pct. #3 in Jourdanton. The bride’s gown was lace ivory with a red bride’s belt, 3/4 sleeves and tealength from David’s Bridal. She wore a silver diamond headband from David’s Bridal. The bride carried a bouquet of long-stemmed red roses, pearl sequins with wrapped twine made by the mother of the bride. The bride and groom were honored at a small intimate reception catered by Larry and Diana Morado, at the LaGrange residence in Jourdanton. The newlyweds will reside in Jourdanton. The bride graduated from Johnny Economedes High School in Edinburg in 2003. She is a graduate of San Antonio College of Medical & Dental Assistants and earned her Registered Medical Assistant credentials in 2009. She is also a graduate of The Art Institute, and in 2014 she earned her Bachelor of Science degree in Design and Technical Graphics. The groom is a 1996 graduate of Jourdanton High School. He is employed with Dowdy Ventures LLC Construction Services.